I’m not the type of person who complains much. I strive to keep a positive outlook and focus on the good things in life though occasionally I voice some dissatisfaction with politicians or personal hardships, but rarely in a public forum. That being said I’d like to go on record as saying this has been neither a good nor normal spring. Not that I’m complaining mind you, but May and October are my two favorite months of the year and the May I just lived through was anything but normal or favored. June was an evil twin sister. Excessively frequent and heavy rain, late cold-snaps and an endless procession of nasty thunderstorms trampled much of my normal spring activities and created more than a few personal hardships. The electrocution of a box full of bluebirds in the yard by lighting, the loss of my “Man Cave” surround sound system to same and the announcement by my mechanic that it was time to call in hospice for my pickup truck topped my list of unfortunate occurrences during Spring 2013. However, with all the rain and cool weather my lawn grew beautiful, lush and green. If only my mower hadn’t been in the shop for a month, waiting for back-ordered parts. C’est la vie. I wouldn’t say fishing has been more difficult than normal this spring but I will say it’s been a challenge to find good fishing at times. Local highland reservoirs along the crest of the Appalachian Mountains received so much rain and runoff they quickly rose to full pool and soon exceeded record levels. In response, TVA opened dam flood gates and downstream rivers became almost continually heavy flows, some roaring floods, of often discolored water. Most free-flowing rivers and streams also ran high and stained much of the time. With many reservoir water levels well into surrounding woodlands and rivers running well above normal, places to enjoy traditional spring fishing were limited. The threat of lightning, high winds and yo-yoing barometric pressure caused by a steady stream of weather changes further complicated planning fishing time. 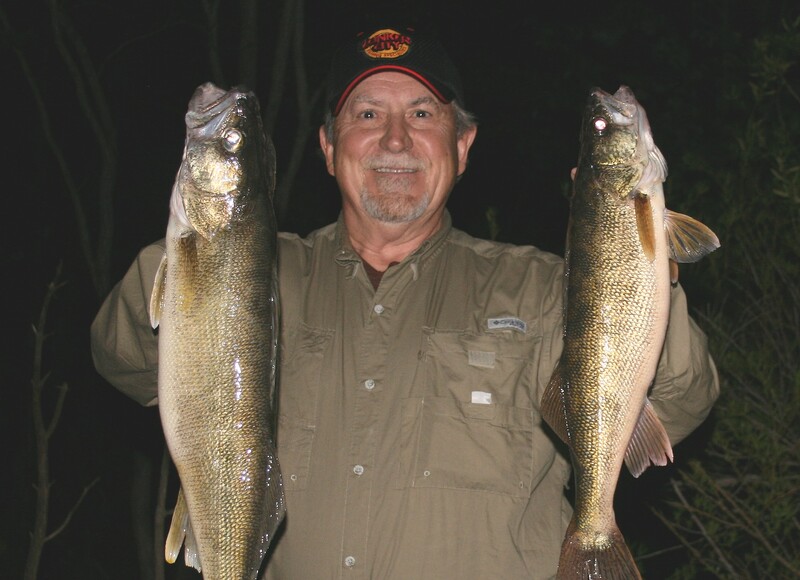 If you’d like to try some challenging fishing that will test your patience and skill, try casting minnow lures into a flooded forest at night for walleyes with the wind blowing 20 mph. At one point, I considered taking up bowling. Despite the extremes in weather, the fish were still out there doing what they always do during spring. 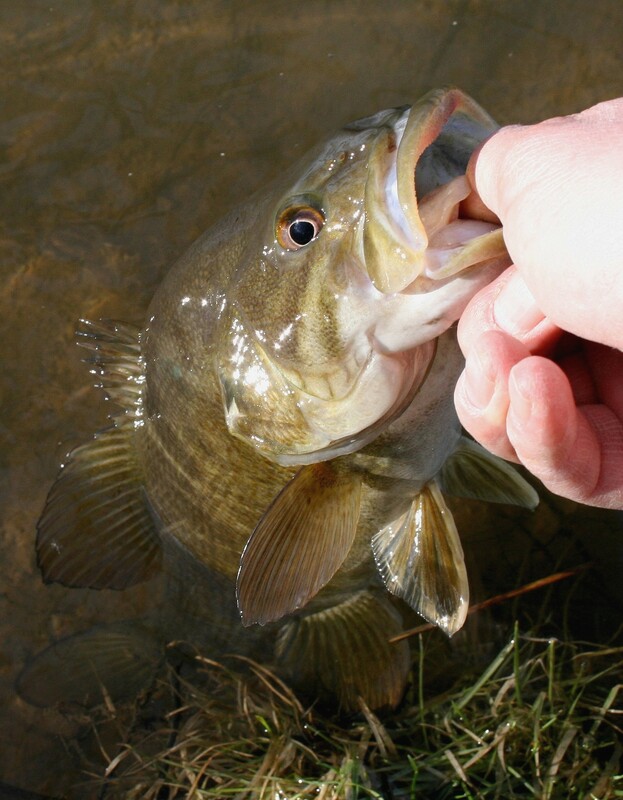 Fish move, feed, spawn and otherwise go about their normal routines based on time of year and water temperature. However, fish move or change their activity during adverse conditions and knowledgeable anglers who want to continue to catch fish change with them. I use two approaches to find good fishing during periods of high, stained water; targeting species that are unaffected by or predictably active in stained conditions or searching for water clarity that is closer to normal. 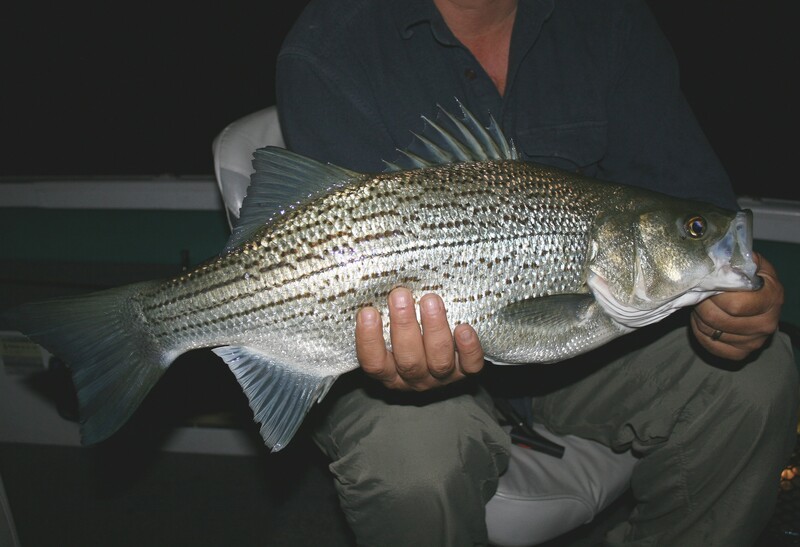 Spring spawners like crappie, bream, large and smallmouth bass are drawn to shallow shorelines when water temperatures approach spawning temps despite water clarity. Anglers who remain confident and make the necessary adjustments in location, lure selection and presentation can continue to enjoy good fishing for these species. Also, catfish, carp and a few others remain active and thrive in high stained conditions. However, my preference is to find places to fish where water levels, flow and clarity are closer to normal. In reservoirs, that means fishing the dam end where conditions are most stable and least affected by heavy runoff. In rivers, it means fishing tail-waters close to a dam where water runs clearest. 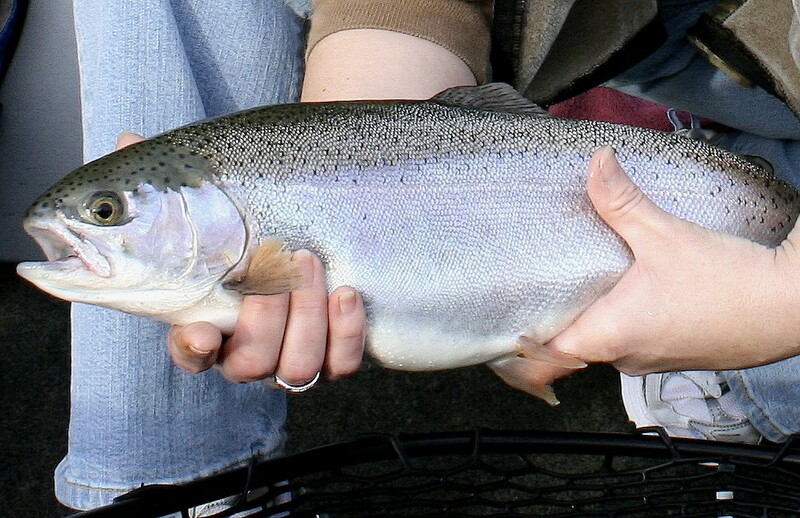 Trout fishing in local tail-waters has been an on-again, off-again challenge this spring. Much of the time, generation rates were so high and water so swift that tail-waters were unfishable. However, my friends and I caught some nice rainbows, browns, brookies and a few lake trout by moving further downstream and fishing channel bends, islands and shoreline structures that held eddies or spots with slower current. On those infrequent occasions when generation slowed or stopped, trout became so cooperative it seemed that they’d missed us as much as we’d missed them. Fishing for river smallmouth bass has been much the same. Further down rivers, feeder streams and other sources injected heavy runoff, creating poor and sometimes hazardous conditions. But during those infrequent periods when the water dropped and cleared, smallmouths were active and offered great fishing. So I’ve spent the last two months camped on weather reports and water generation schedules while making frequent scouting trips to local fishing holes to check water condition. When conditions developed that offered good tail-water or river fishing, we did our best to get there and reap the bounty. Because tail-waters and rivers weren’t often fishable, reservoirs have been my most frequent fishing destination this spring. The lower one-third of most lakes in this area remained clear to moderately clear most of the time although excessive surface debris caused by above-full-pool water levels created hazardous expanses of surface litter in some sections. However, with an ever-watchful eye on wind direction we avoided the worst-affected areas. 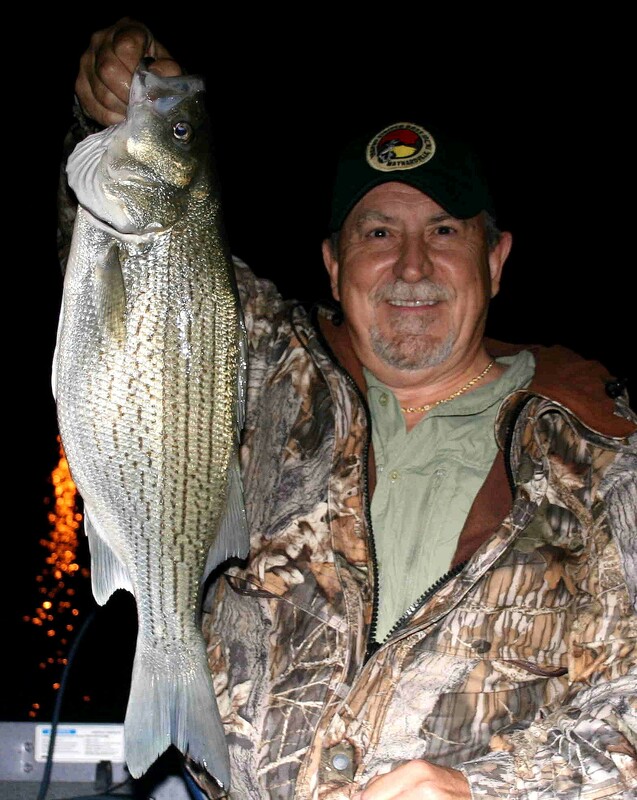 Where water clarity was acceptable and surface debris light the greatest hindrance to finding good fishing most days was fishing pressure because an army of anxious anglers were pushed into the same limited “fishable” water. So we made one more adjustment and changed our focus to reservoir night fishing. As I said before, it’s been a challenge at times to find good fishing this spring. 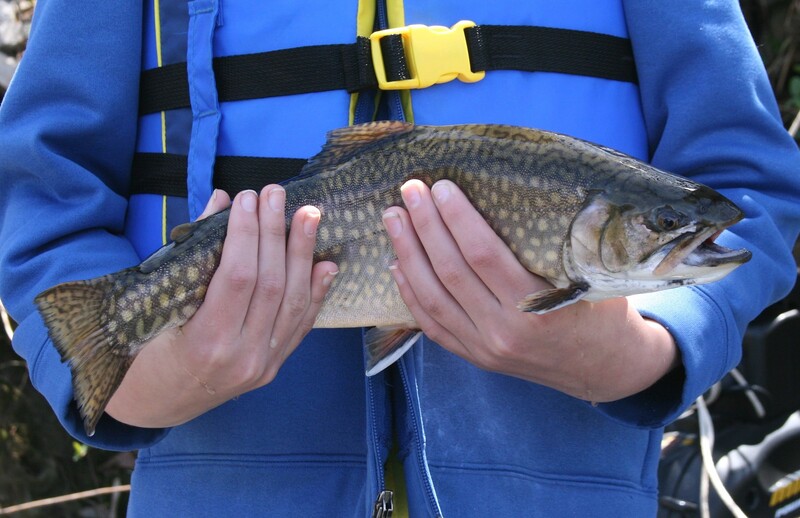 Several trips to local highland reservoirs produced limited success for walleyes. If you’ve read my book, you know I’m a big fan of nighttime walleye fishing in spring and early summer. But water levels in highland reservoirs in this region remained above full pool so the waterline along which walleyes cruise for spawning baitfish in spring was well into shoreline undergrowth. Dense surface debris and frequent high winds another thousand feet higher in elevation made night-walleye fishing on these lakes difficult work. So, fresh walleye dinners have been infrequent at my house so far this year. 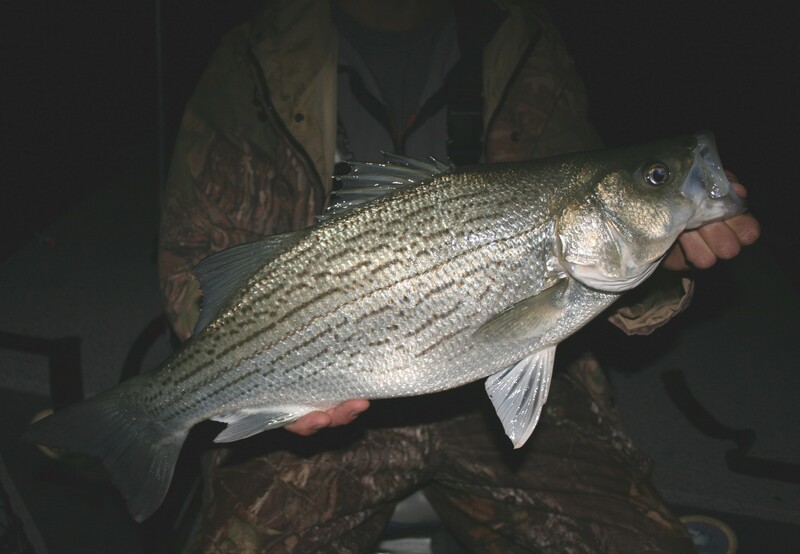 However, our search for good fishing produced some exciting encounters with one of my favorite fish; the hybrid striped bass. 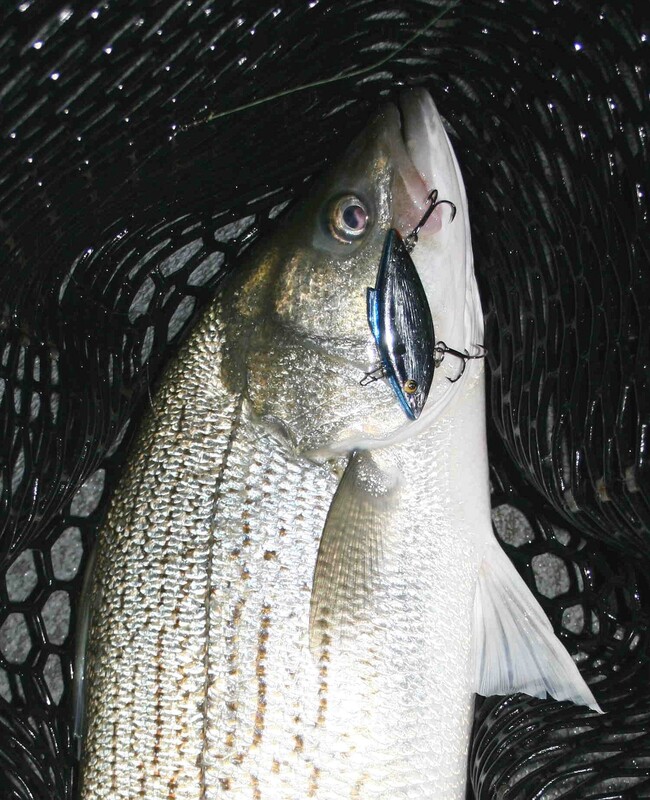 Hybrids, like striped and white bass, are open-water wanderers that follow alewives, shad and other baitfish throughout reservoirs. In spring, when surface temperatures reach 60-degrees, alewives move to shallow shorelines at night to spawn. As water temperature rises further, shad also begin spawning, producing an extended period of plentiful food along shallow shorelines for hybrids and other game fish. So when reservoir surface temperature reached 60-degrees and rising, we scheduled our first nighttime trip to check on the hybrids. The first place we found fish was on a steep bluff along a main-lake river channel. 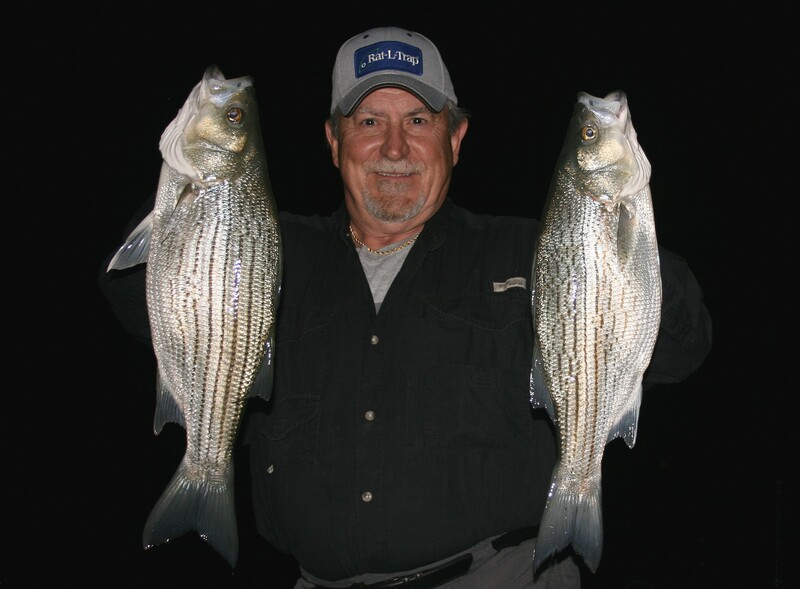 Small Red Fins and Jointed ThunderSticks produced jolting surface strikes from hungry hybrids when lures were cast close to the bluff face and retrieved parallel to the edge. Then, one night when the fish didn’t show along the bluff, we moved and found a hybrid mother-load. In each of the next half-dozen trips to this spot, a friend and I caught more than a double limit of hybrids. 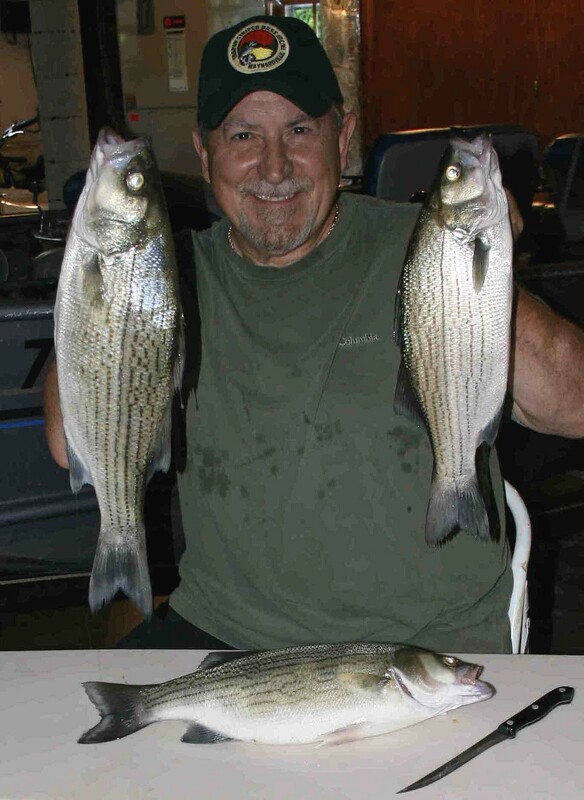 The fish were mixed sizes ranging from three to seven pounds with an occasional small striped bass mixed in. The times the hybrids arrived and began feeding each night varied between about 10:30 p.m. and midnight depending on when baitfish started surfacing and moving into shallow water. However, there was never any question when the hybrids arrived because baitfish schools would suddenly surface everywhere, accompanied by scattered surface swirls and an occasional explosion. The hungry predators would charge in, feed aggressively for a brief time, scatter the schools of minnows, then everything would become still. Soon after, the hybrids would again push the baitfish into tight schools, herd them back into the shallows and the feeding binge would resume. So when the hybrids first decided it was time to hit the supper table, action became hot for several hours, interspersed with occasional lulls; good times to check line condition, retie or change lures. 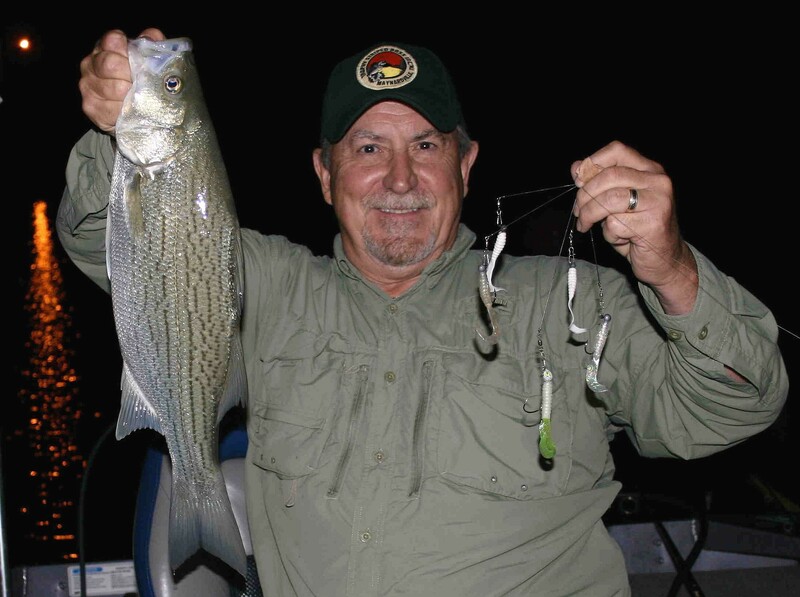 Rat-L-Traps are among my most dependable tools for hybrid fishing at night but we caught fish on several others. Topwaters are personal favorites so we tried minnow lures, walk-the-dog baits and surface poppers. Red Fins and Thundersticks continued to attract an occasional strike but larger surface poppers produced best when the hybrids were up and feeding. I always keep a popping lure rigged and ready when fishing for schooling game fish because I believe the sound they make often attracts feeding fish or encourages continued feeding. But without question, the most productive lure we used was one I tried this spring for the first time. I had learned from several good anglers that it was a deadly choice for hybrids and other game fish and knew it was the hottest lure on the bass tournament scene, so hot it had raised much controversy among tournament organizations and state fisheries agencies. Technically, it’s not a lure but an array of lures called the Alabama Rig, aka the A-Rig. A-Rigs have been around for a long time but until recently were best known by anglers as umbrella rigs; trolling tools for open-water fishing in fresh and saltwater. But when tournament professional Paul Elias used a casting version to win a major FLW event on Lake Guntersville, Alabama it turned the bass fishing world, and traditional perceptions of the umbrella rig, upside down. Anyone who fishes much for large and smallmouth bass knows about the A-Rig. Most have used them, have friends who use them, have read about them or have seen them on television fishing shows. Through many sources, I also had learned about them and become convinced of their effectiveness. After we found that large concentration of hybrids, I remembered a friend had given me a locally made version of an unrigged A-Rig so I decided to dig it out, load it with soft plastics and do some testing. The A-Rig I’d been given had five wire arms so the first thing I had to decide was how and where to attach two attractors. 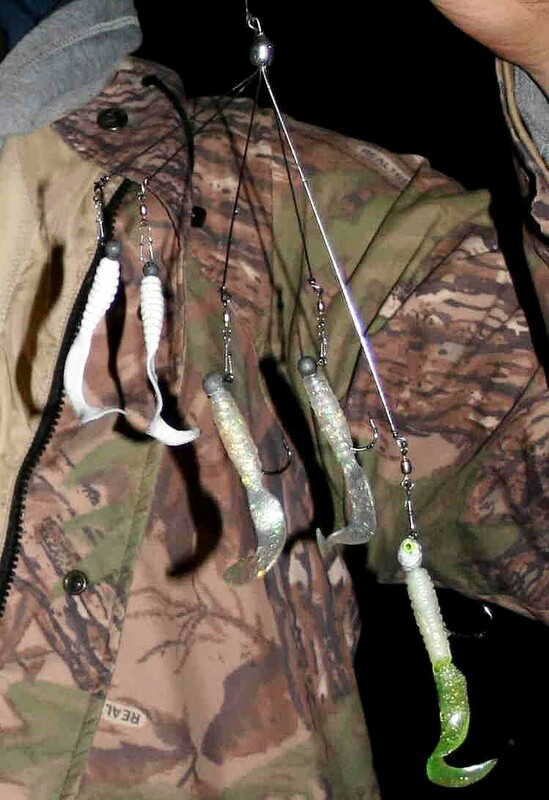 In the State of Tennessee, A-Rigs may have only three hooks of any type, though five-arm A-Rigs are legal if two of the arms hold only attractors. A drawing in the state fishing regulations booklet shows a five-arm A-rig in which two arms hold willow-leaf spinner blades. I considered adding blades to my test version but decided it would be easier, and less expensive, to cut the hooks off a couple soft-plastic rigs. So I grabbed a pair of needle-nosed pliers, my tool box of curly-tailed grubs, some jig heads and went to work on my newest fishing tool. I bent the longest arm on my A-Rig at a downward angle and added my primary lure; a heavy-duty, 3/16-ounce pearl/glitter-colored jighead with chartreuse eyes. To the jighead, I added a four-inch pearl-colored curly-tailed grub with a chartreuse tail. Because predators often attack schools of baitfish from behind or below, I wanted this bright-colored bait to be slightly larger, below and behind the “school” I was presenting. This lure was also heaviest, acted as a keel and helped keep the light-weight A-Rig from turning or spinning during the retrieve. I bent the next two arms in opposite directions angled outward, added unpainted 1/8-ounce jigheads and three-inch pearl curly-tailed grubs. I bent the remaining two arms up and outward and added small unpainted 1/16-ounce jigheads to hold my attractors. To these I added white two-inch curly-tailed grubs; slightly more visible in the limited light but smaller. Before mounting these two, I cut the hook points off at the center of the bend then super-glued the grubs in place on the remaining portion of the shank. The first time I pulled the A-Rig through the water at boat-side, I was impressed with what I saw. The awkward looking A-Rig casts surprising well using a heavy flipping stick, baitcasting reel, and braided line so after a few casts I was comfortable with my newest fishing tool and settled into a routine of long casts followed by a slow, steady retrieve. After less than a dozen casts, a nice hybrid struck hard. When a much larger fish smashed the rig on the next cast and began ripping line from my reel, I was hooked for good on the Alabama Rig. After catching another fish or two, I cut the rig off and handed it to my fishing partner so he could do some testing with his heavy spinning combo. His first hybrid on the A-Rig was a line-screamer that weighed more than six pounds. On several follow-up trips together, we used the same A-rigs and continued to enjoy some productive fishing for one of my favorite fish. Though I missed the great spring night fishing for walleyes this year, and those fabulous walleye dinners, hybrids provided plenty of exciting action and some fine fillets for a few of my favorite fish recipes. Many anglers don’t eat hybrids but they’re missing some fine dining. Bleed the fish you intend to keep as you catch them, then throw them in a cooler or livewell and cover them with ice. Remove all the red flesh from the fillets during cleaning and you’ll be impressed with the firm, beautiful meat. Hybrid fillets are mild-tasting and good choices for grilling, in sauces or any recipe calling for mild, white-fleshed fish. So it’s been a challenging 2013 fishing season so far but I can’t complain because I’ve caught some nice fish, enjoyed a bounty of fresh fish fillets and added an exciting new tool to my fishing toolbox. And I did finally get my lawnmower repaired and the grass under control so if it stops raining at least one day each week I should be able to keep it looking beautiful. Furthermore, after an extended trial of patience I bought a new boat-hauling vehicle, though it took the dealer two tries to get the correct one brought in from a distant location. It could happen to anyone. I’m convinced the rainfall will moderate soon since we’re already more than 14.75 inches above average on rainfall and approaching the all-time record. When the weather finally returns to normal, tail-water and river fishing will become very good so I’m going to remain patient, retain my positive outlook, repair the rest of my broken fishing equipment and chip away at my Honey-Do list. And I should have plenty of time to get ‘er done because it’s supposed to rain four of the next five days. When summer temperatures peak, good daytime fishing opportunities become more limited. The blazing sun, high temps, high recreational use, and other reasons prompt many anglers to stay off the water during daylight hours. However, I’ve discovered a cool summer option that produces some of my most impressive daytime trophies of the year; fishing for big rainbow and brown trout in tail-waters. Every tail-water is a unique environment in that water depth, flow, temperature and other characteristics vary. Not all tail-waters offer good year-round trout fishing because of high water temperature during summer months. Most are stocked during spring, many in fall, but those with low carryover in summer are poor choices for numbers and worse choices for big trout. 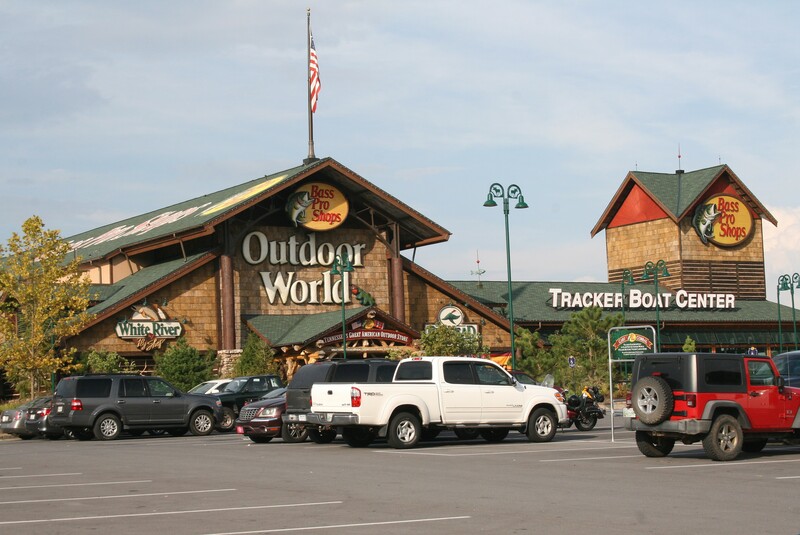 The tail-waters I fish most in East Tennessee commonly run between fifty and sixty degrees throughout the summer period with extremes in the high-forties and low-sixties; ideal temperatures for trout. Find a tail-water close to you that is well stocked with year-round temperatures in this range and you may have found a gold mine of summer fishing. 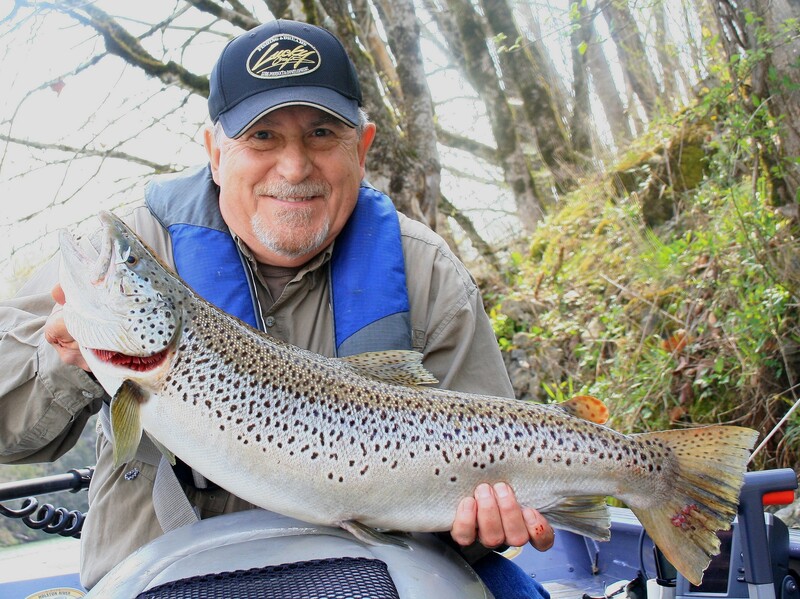 State fisheries agencies are a good source for information about which tail-waters in your area offer the best summer trout fishing as well as which have the potential to produce trophies. And many Web sites and chat rooms tailored to area fishing provide reports by member anglers that can guide you to good tail-water fishing. Do your homework, find a tail-water or two with good potential closest to you, and the next thing to consider is access. If your goal is to wade and spin or fly-fish, water depth, flow and plentiful access points are important considerations. 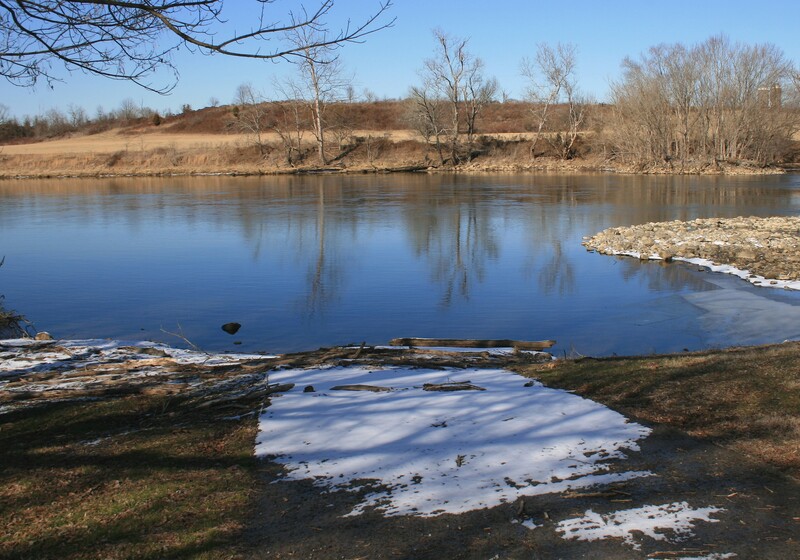 If you plan to float in a drift, Jon or other small boat, you must consider the distance from launch to takeout points and the nature of the river. Talk with other anglers at ramps, in chat rooms, at a local tackle shop or other places and develop a plan for fishing that puts safety first, always, and good fishing a close second. After choosing a promising tail-water, it’s important to find a source for water generation information. TVA has a user-friendly Web site where you can check planned 24-hour generation schedules and flow rates for any dam in the TVA system. The Army Corps of Engineers provides a US map on the Corps Lakes Gateway page on their Web site where visitors can select a state and go to a listing of that state’s lakes and waterways under Corps control. 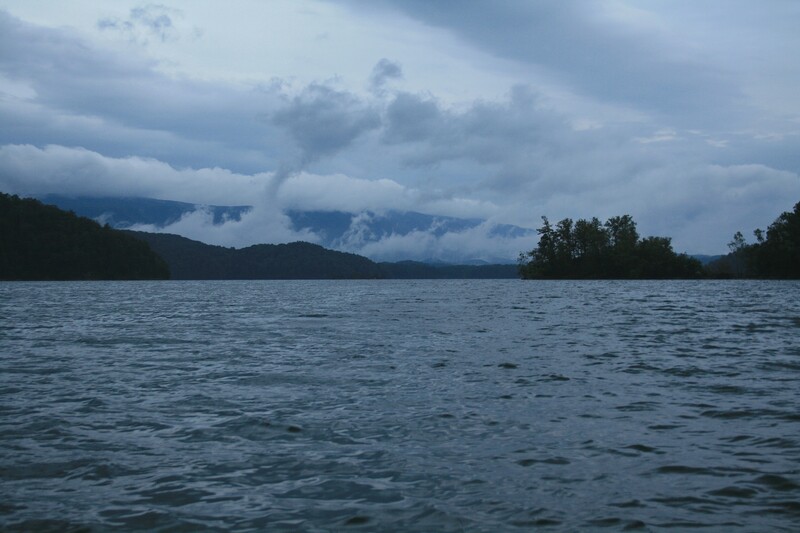 Choose the dam and tail-water in question and you’ll be directed to an information page where a link or phone number is provided to check lake information, including planned generation. You can find a link to both these Web sites at the bottom of my home page under the “Blogroll” heading. Unless you’ll be limited to fishing close to a dam, it’s helpful to know how long it takes for the change in flow at the dam to reach key points downstream. If your target fishing area is many miles long, choose a place or two along the way where you can monitor the flow and determine how long it takes for a change in flow at the dam to reach that point. Then you can plan fishing time under the best and safest conditions in that section. But remember; planned generation schedules are planned, not chipped in granite, so schedules can change without notice. On the tail-waters I fish, I’ve found them reliable and accurate but I have seen variances. Plan your fishing time based on published schedules, plan for the unexpected, and you can enjoy productive and safe fishing for some beautiful summer fish. Tail-waters offer good fishing for trout anytime during the day when generators are running and water flow is high and swift. Primary moon phases, overcast skies, prefrontal conditions and low-light periods at dawn and dusk can intensify activity and improve the odds of catching more and larger trout but many feed in fast water on the clearest days under sunny skies. 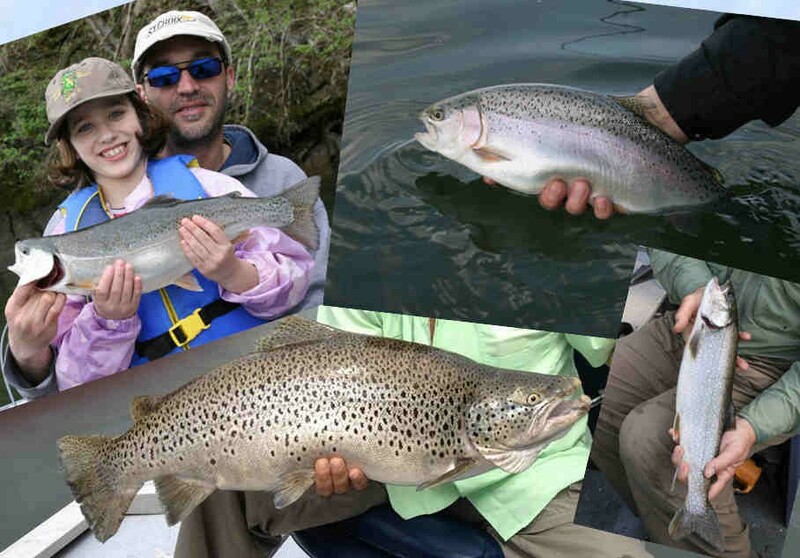 Therefore, tail-water trout fishing is a good choice anytime if generators are running, you choose the best sections of water available and the right lures and methods of presentations are employed. Because water is pulled from well below the surface at most dams, water temperatures are lower during generation and trout become active in the cool swift water, especially larger fish. Smaller fish that feed mostly on insects may be more active when generators are off and the water is flat and calm but when the current increases and visibility decreases, larger fish leave hiding spots to hunt and feed on larger prey. Both rainbow and brown trout move and feed during the day in swift tail-waters but after the sun sets, brown trout become the dominant predator despite the rate of generation. 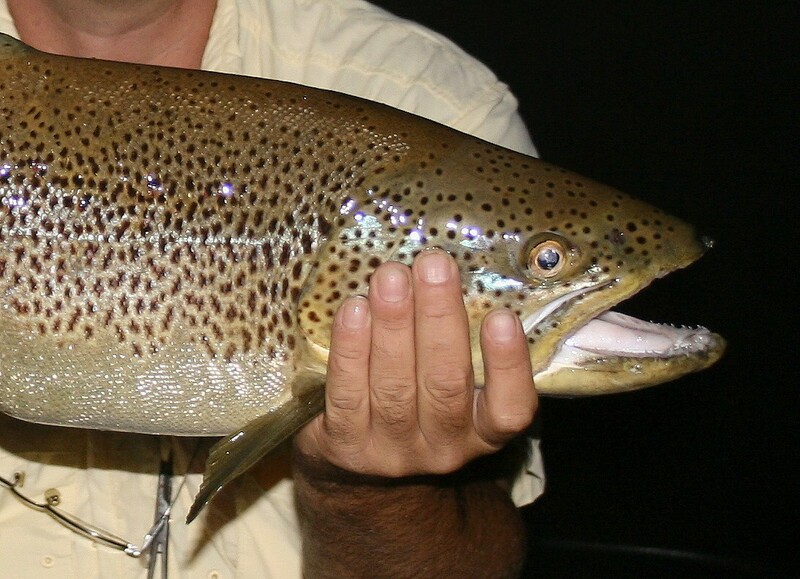 Some of the largest browns I’ve ever landed were caught at night in tail-waters when no generators were running and the water was still and flat. You have to be cautious and as sneaky as a cat when night fishing for browns in still water but the rewards can be incredible. 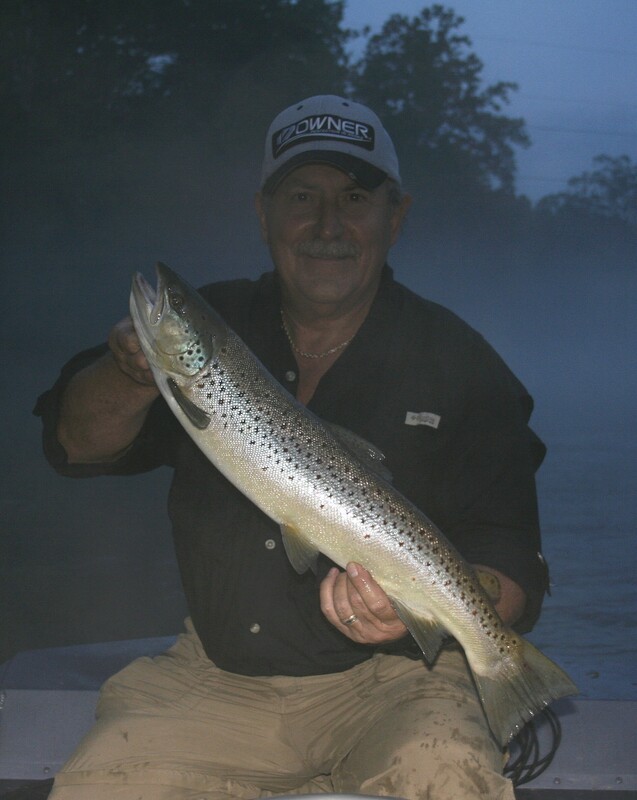 Rainbows seem to disappear with the sun but browns become active and very aggressive at night. Find a section of tail-water with mixed deep and shallow areas that you can safely fish after darkness falls and your chances of catching a giant brown trout will increase greatly. Tail-water fishing for big trout is an adventure most anglers adapt to quickly. If you fish most for bass, walleye, or hybrids you’ll feel at home with the tackle and methods of presentation required for success, especially so if you’re used to fishing rivers. Medium to medium-heavy spinning combos with six- to ten-pound diameter monofilament or braided lines are the equipment of choice, though baitcasters and slightly heavier lines work well with larger lures. I use a six-and-a-half-foot medium-heavy spinning combo spooled with 6/14 smoke colored Fireline for lures up to 3/8-ounce and a seven-and-a-half-foot heavy action combo with 8/20 Fireline for heavier lures. Ten- to fourteen-pound leaders of monofilament or fluorocarbon help prevent break-offs in shallower tail-waters so don’t hesitate to add them when needed. Add a quality-made snap to the business end of your line to support quick lure changes and always test retrieve lures before use to insure natural actions; tune or replace those that don’t run true. Floating and suspending minnow lures in various sizes and colors round out equipment needs though particular tackle and lure choices should be made based on the target species because rainbow and brown trout preferences differ. Rainbow trout favor shallower areas with swift, broken water and clearly visible seams and current breaks. Work lures along current edges and through eddies while fan-casting large areas with more uniform flow. Slow steady retrieves or fast retrieves mixed with intermittent erratic twitches that make lures dart and change direction are reliable methods of presentation so it’s best to alternate between these until fish show a preference under current conditions. 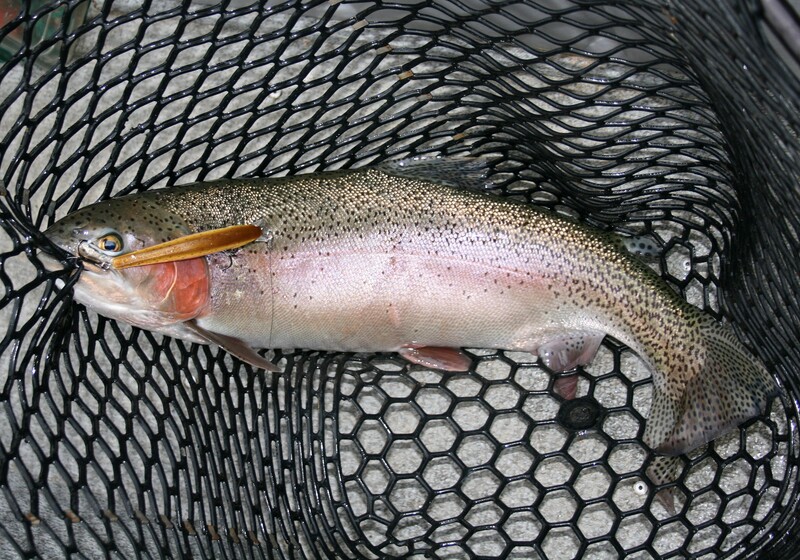 Rainbows have small mouths compared to their body size and prefer smaller lures to about three-and-a-half inches long. Minnow lures with shad profiles like Lucky Craft Pointers in smaller sizes and Yo-Zuri Sashimi Jerkbaits have fooled many big rainbows, including some of my largest, but rainbows often strike slender minnow profiles best like Rapalas or Lucky Craft Slender Pointer MR’s so it’s best to carry a few in each body shape. Floating models are better choices in shallower areas because many times they’ll float free of hang-ups when the retrieve is stopped. But suspending models offer more natural presentations with erratic retrieves because they retain their depth and pause directly in the face of following fish. When a big rainbow strikes, most will quickly announce their presence by shooting through the water’s surface like a fat missile. An angry rainbow trout in shallow, fast water is the gold-medal gymnast of the fish world with more tricks than a circus monkey. You can expect drag screaming runs and an impressive aerial show so a properly set drag and longer, more shock absorbing rod are important factors that may determine who wins the fight. Brown trout have different personalities than rainbows so when targeting them it’s necessary to make a few adjustments in presentation and lure choice. As a rule, browns prefer spots with a little less current and some overhead cover. Search for them in current breaks behind logs or large rocks along shore, in deep holes where current slows or on inside bends in the river. Not that you won’t catch one in swift, shallow water in mid-river but when you do, the fish probably followed your lure from slower water before deciding to strike. 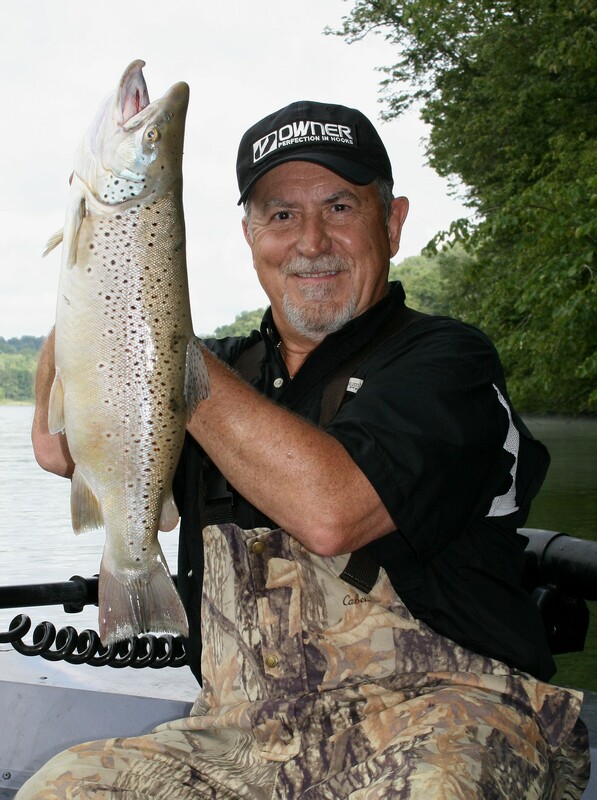 Big brown trout are notorious for following lures all the way to the rod tip so a little figure-eight action at boat-side is a wise addition to the presentation process. Because browns like to follow, slow to medium retrieves with occasional stops are highly effective methods of presentation. This tendency to follow makes suspending lures top choices for big brown trout in tail-waters. Stop the retrieve for a few seconds to a half minute and let the lure suspend and drift with the current as you watch your line. If the line jumps, suddenly begins to move or you feel a light tick, set the hook fast! Smaller three-and-a-half inch lures will catch many small- to medium-sized fish but to catch big browns use large lures, larger than many would believe for trout. Four- to six- inch minnow lures are good choices for large brown trout in tail-waters and when in doubt, err to the large side. I use four-inch sizes most during daylight hours in summer because during years of normal weather, the water is very clear. To create the illusion of larger prey, I often use lures with chrome, holographic or other highly reflective finishes to increase flash and make them look larger without letting trout see the lure too clearly. 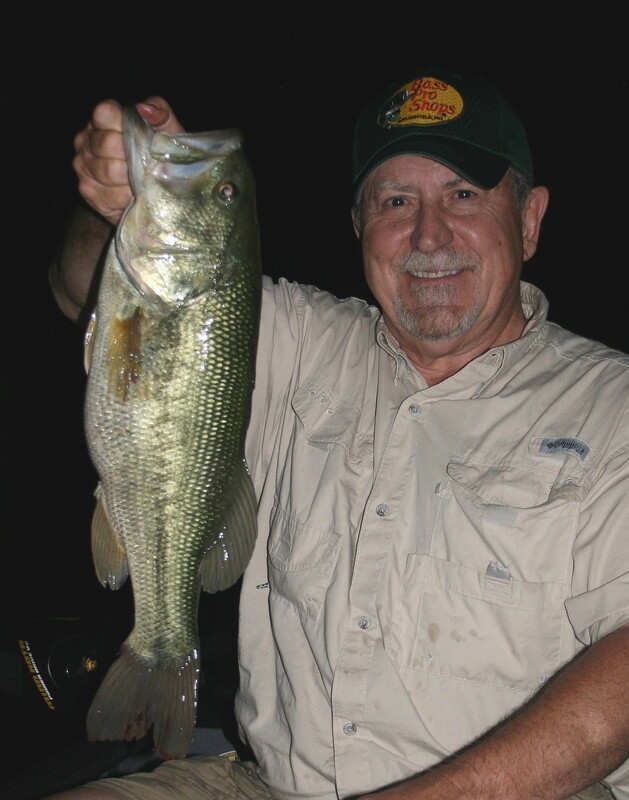 Under low-light conditions, I use larger lures in the same color patterns or those with brightly painted finishes. Most brown trout don’t explode with the same level of energy as rainbows when they strike. It’s most common for the rod to suddenly bow and the drag to slip in short bursts, depending on the size of the fish and the drag’s setting. Occasional you’ll meet an aerial acrobat but most big browns wallow on the surface like a stuck pig, sound and move off steadily against the drag. As different as the two species are, they do share some common traits. In most tail-waters, larger prey items that big trout feed on are limited to some type of shad minnows and smaller trout. So shad or minnow profile lures in colors that mimic these prey species are highly attractive to both rainbows and browns. My top three color choices for browns and rainbows are shad, rainbow and brown trout color patterns. However either species, at any time, may climb all over a lure with a gold flash or brilliant color pattern so it pays to carry a few of these in favorite lure models and sizes. And changing to deeper diving lures when water depth increases isn’t necessary. In the clear water common to most tail-waters, rainbows and browns will rise many feet to strike shallow running lures, eliminating the need to carry a selection of sizes and colors in deep diving models. The most important trait these fish share and one all anglers should remember is how sensitive trout are to high air temperatures and handling. 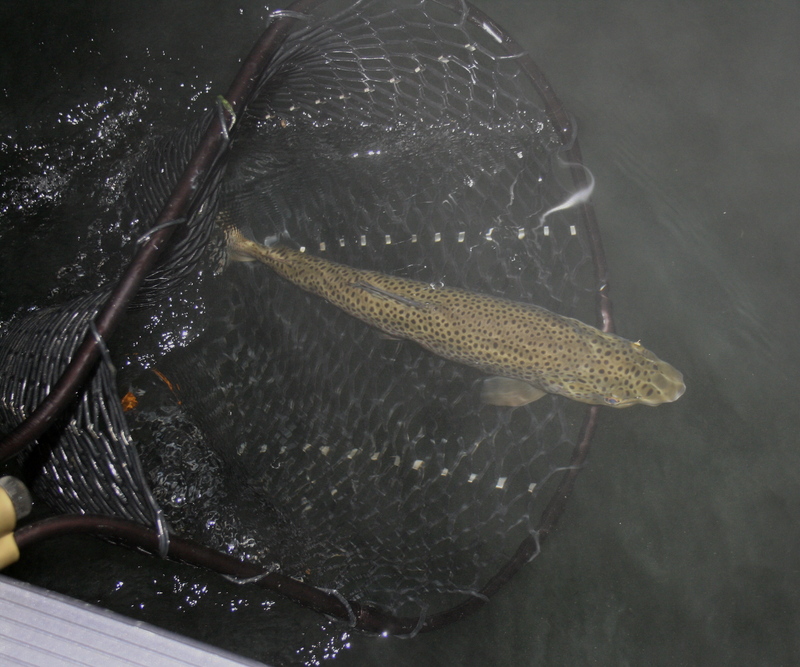 It’s best to unhook a trout while in the net where you can quickly and safely remove hooks, then let it rest in the net while you get a camera ready. 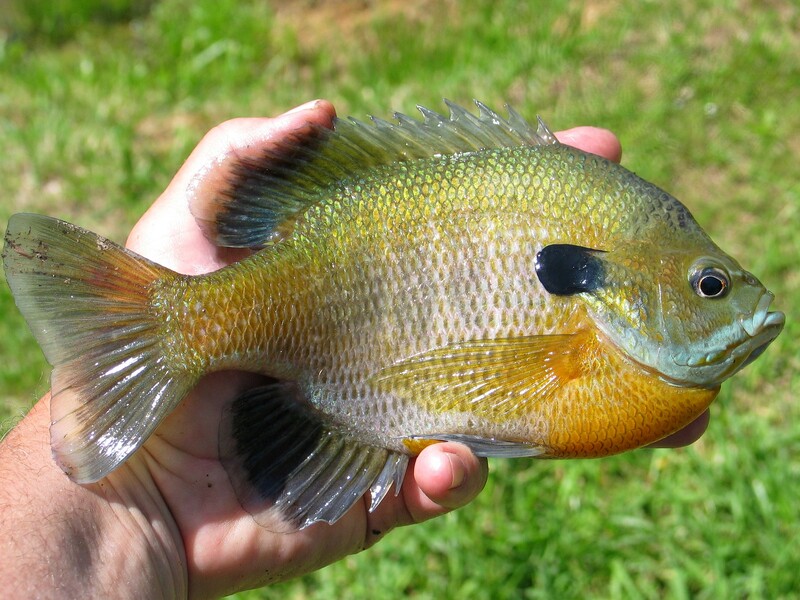 Wet your hands and lift the fish long enough to take a couple pictures, then set it back in the net until it recovers. 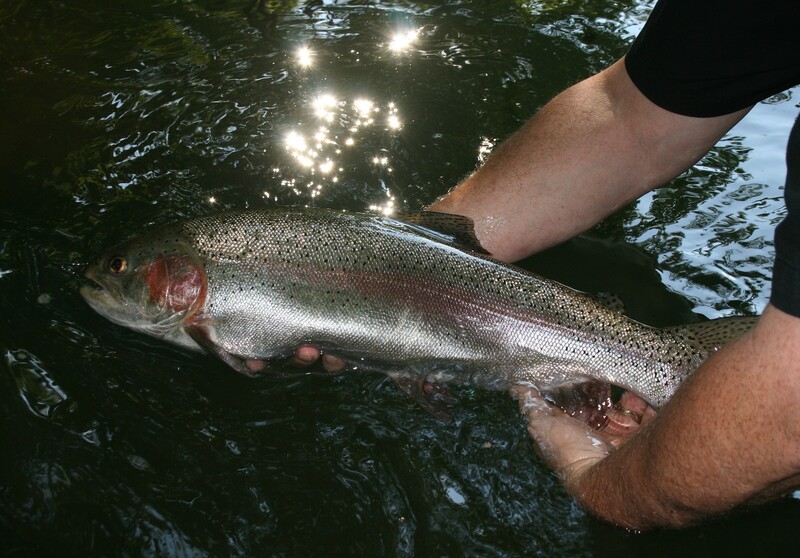 If the trout cannot swim upright, move to a safe place in still water and hold the fish upright until it recovers. Take time to insure each fish is released in the best condition possible. Remember, if you’re ever going to catch that eight- to ten-pound trophy trout of your dreams, you must release the four and five pounders in good condition.